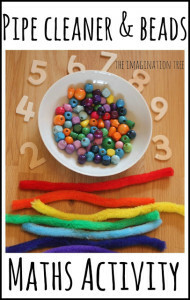 This is a fun and easy activity that practises some great fine motor skills as well as promoting creativity with a little maths tossed in along the way! For this we needed to dye some large pasta shapes. 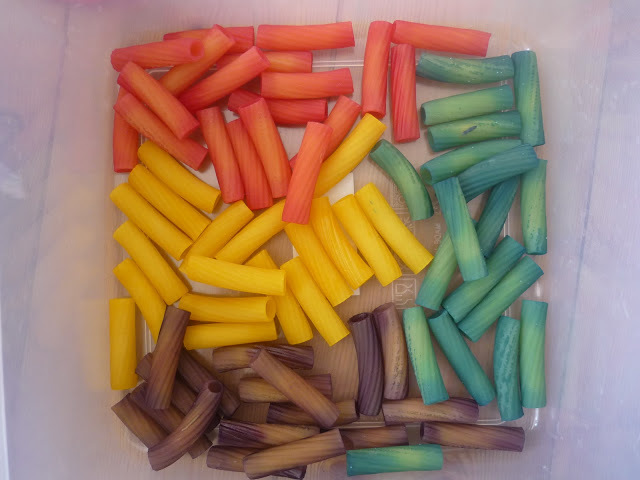 We used rigatoni and it was easy to dye. 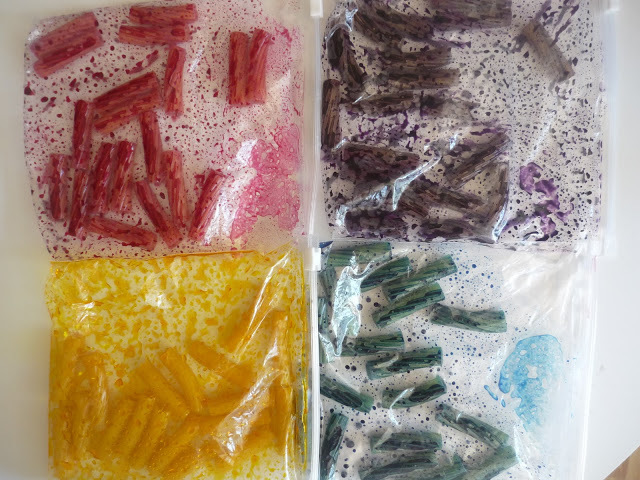 I separated the pasta into 4 zip-loc bags and added some liquid food colouring to each. We then shook them up and left them to dry for a day, when I tipped them onto kitchen paper and let them finish drying in the air for another few hours. Ta Da! 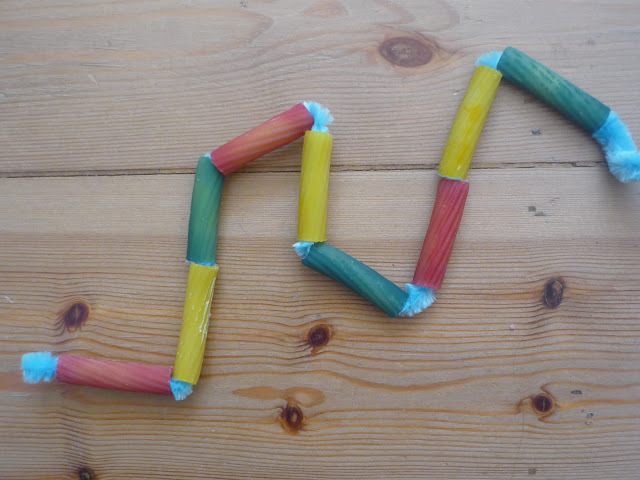 Pretty rainbow pasta for all sorts of sensory fun and play. 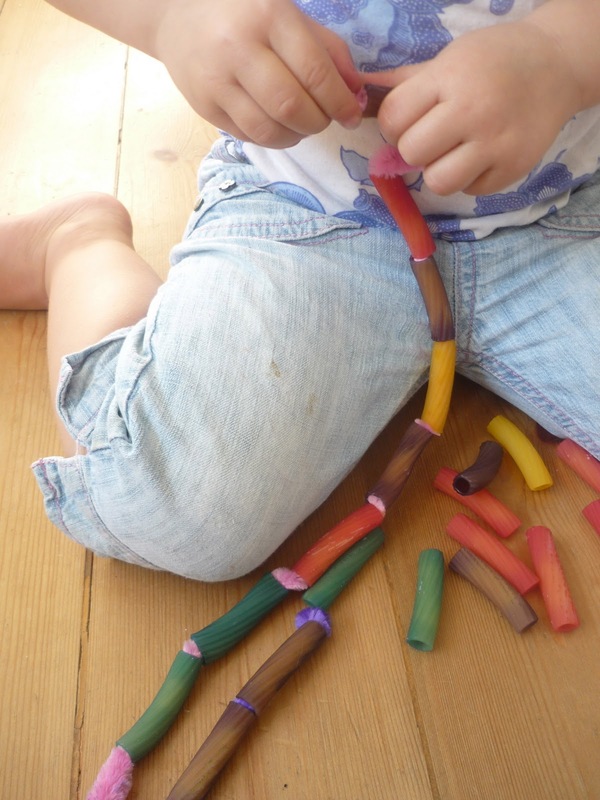 Next we found some thick chenille pipe cleaners (ours came from the £1 shop) and used them to thread the pasta onto. 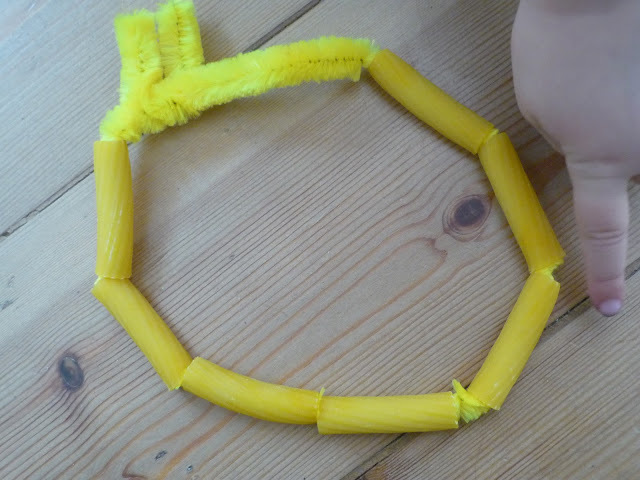 Cakie struggled at first as the pipe cleaners were thick and needed to be pulled through. 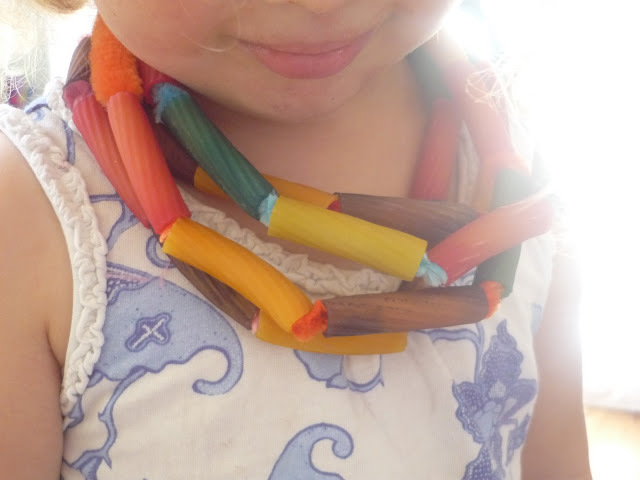 She soon got the hang of it and started to thread lots of necklaces and bracelets, wanting to wear them all in one go! 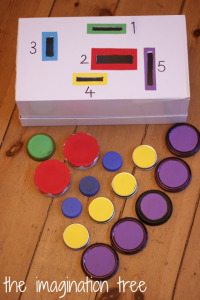 We had a go at making some in repeating patterns and others that had to be only in one colour. Here’s one of her all one colour results- yellow matched onto yellow. Lovely! 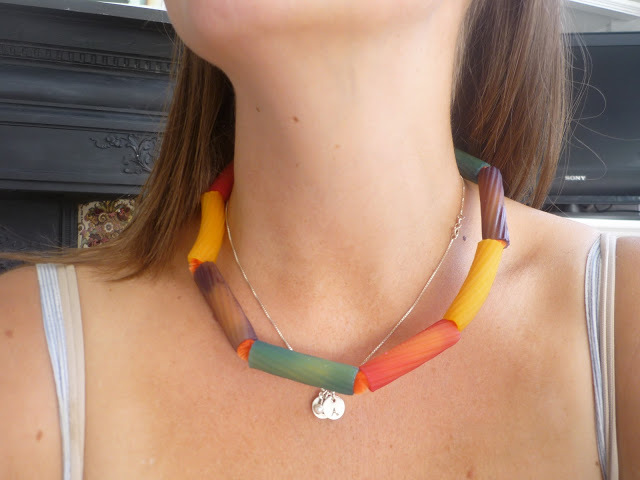 And of course I had to model one too! 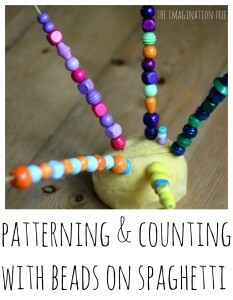 There are so many possibilities with this activity and it can be as open-ended or as challenge led as you want! Really pretty. I’d love to try this one! 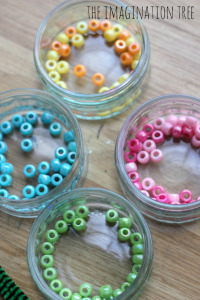 I love the idea of threading with pipecleaners. My little one would enjoy that! We use the same method for dying the pasta, but add a drop or two of alcohol hand sanitiser in the bag and I find that it distributes the color more evenly and dries a little quicker as well. You can also use the same method for coloring rice. Thanks Kitty! 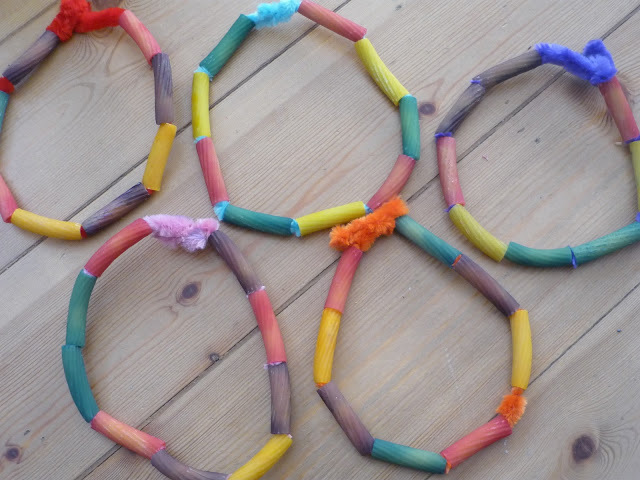 Hope the pipe cleaners work out well for your little one too! Emma- thanks for that tip! I’ve heard that somewhere before but not tried it yet. I have lots of that sanitiser stuff so will try it. Thank you! Teaching young children to “play” with food sends the wrong message. For many families (like the 1 in 6 living in poverty in the US right now), foods like pasta, rice, dried beans, and potatoes (often used for “stamping” activities in preschool classrooms) are a precious resource, not a toy. I once heard a director tell a story of how a young immigrant mother asked her if she could take the rice home from the sensory table when the children were done playing with it, because she wanted to cook it for her family. The director said she had never felt so ashamed. 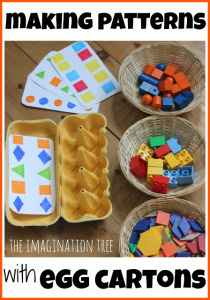 There are many other ways for children to express themselves creatively that do not involve food, and I encourage you to use this blog to let other teachers know about those. All children should be raised to understand that food is a resource and a commodity, not a toy. PS to ANONYMOUS – I can see where you are coming from, however, isn’t this more a question of poverty and resources in general rather than whether we are wasting food or not? Why is it “bad to waste” a $ worth of pasta but ok to “waste” $5 dollars worth of glitter? Surely that $5 dollars spent on glitter could have bought so much more pasta for a hungry family? 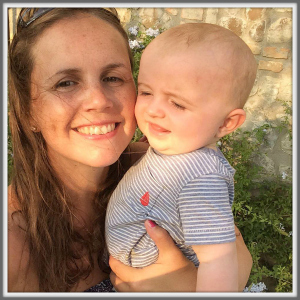 I minimise ALL the food waste in our house – compared to other homes I know. Surely that is as much as the problem as anything else. 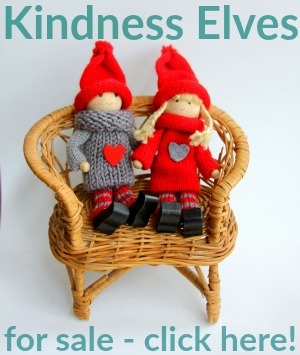 So why “pick on” crafts… the issue is much broader. And playing with food resources isn’t necessarily bad. Anyway, I could go on for ever and it is a much broader debate and not one activity should be singled out over another. Oh, the ubiquitious immigrant woman who wanted to take the rice home! I’ve heard of her so many times! Where do we stop? Do we ban paste (flour and water)? Should we ban playdough? What about water play – a precious commodity in many parts of the world? Should we prevent babies from playing with their food (good luck!)? Ought we to force-feed our children to ensure they don’t waste a scrap? After all, there are millions of starving Africans/Indians/Immigrants/etc. There were when I was a child. Stopping children from playing with pieces of pasta doesn’t feed them any more than forcing me to eat all those years ago. Wars cause starvation; greed and corruption causes starvation; failed crops causes starvation. Little children playing with pieces of pasta makes no difference whatsoever. Sort out the former before you complain about the later!